Do you have a southern oriented roof? In North America, the sun crosses the horizon in southern orientation (see illustration.) Your roof can face east or west as well, but south is best. Of course, flat roofs can be more flexible. Do you have sufficient roof space? We’ll need to assess this after we figure out your needs and solar thermal potential. Once again, south is best. Do you live in a “warm” or “cold” climate? A region is considered a cold climate if it is prone to freezing temperatures in the winter. Cold climates require a closed loop system using a special antifreeze fluid to eliminate damage to pipes when the outside temperature drops below freezing. We also use evacuated tube collector panels for higher efficiency when the ambient temperature is significantly lower than the fluids return temperature. A region is considered a warm climate if it is not prone to freezing temperatures in the winter. A warm climate allows us to use an open loop system where water circulates through your collector into a boiler. The open loop system allows simpler and, therefore, lower cost system. Want more information about going solar? 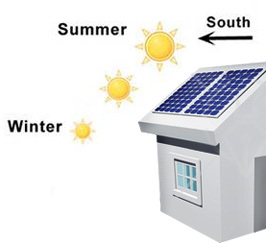 Read: How does a solar hot water system work? For a free evaluation of a solar hot water system for your residential or commercial application, contact us.